Chinh’s Riverside Restaurant seems to be a family-runned place. It is nice place to watch the river flow by. It is is the great seafood restaurant in Hoi An. Why Chinh's Riverside Restaurant is special ? One of specialest features of this restaurant is that the food and drink are always fresh and original, which makes dishes here truly delicious and unforgettable. The price is also pretty reasonable, so that guests do not have to worry about running out of cash to pay. The place is right before the bridge bringing you back to Hoi An old town. The view is fabulous since you can see the river. You can watch two fisher folks who sit so still that you think they were puppets put on water as a symbolic tip of the hat to the fishing life. How to get to Chinh's Riverside Restaurant? The place is right before the bridge bringing you back to Hoi An old town. 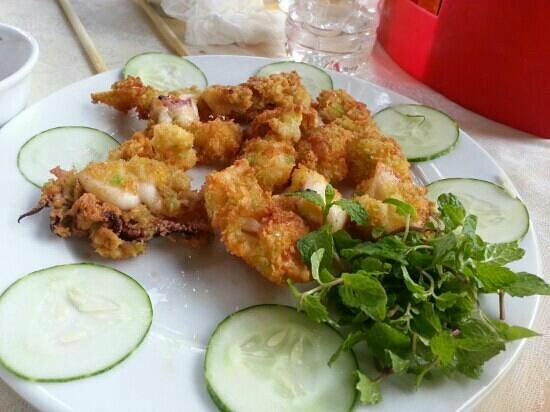 Go head east on Tran Hung Dao then continue onto Cua Dai to reach the restaurant. The restaurant is easily reached by bicycle, about 20 mins riding from Hoi An. The ride is pleasant past lagoons ringed by coconut trees and with fishing boats making an idyllic scene. There are little riverside cafes where you might stop for a cold beer and snacks. Unfortunately we had a very unpleasant experience dining here, first it took almost an hour for our food (we were the only ones there! ), then our starters were wrong so we sent them back, then when the mains came out I found a big long hair in mine so I sent it back, by this time I was fed up and just wanted to go, another lady brought the same dish out minus the hair as we were leaving and tried to tell us that there was never any hair in it! We ended up paying for everything we ordered (although we did not eat it) as they were getting aggravated and I just wanted to leave. I've been travelling to Hoi An for several years and found that this is my favourite and most trusted place to eat. Quiet little waterside restaurant half way between beach and town in Hoi An. We found it on our last night and wished we'd come earlier - the food was delicious and the prices cheap. Flavours were perfect - not the pale bland versions of dishes we were disappointed to find in many other Hoi An restaurants. Portions are huge - made for sharing - though it's so good you'll eat it all!